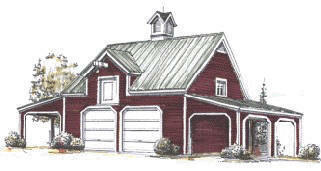 The Elm Grove Car Barn has a 24'x24' two-bay garage at center, with stairs to a full Loft. Two, inexpensive, 10'x24' carports add more sheltered parking. The garage and loft are each 576 sq. ft. Total carport area is 480 sq. ft.